So the long weekend was great but as usual Monday came way too fast and was way to tough to bare. 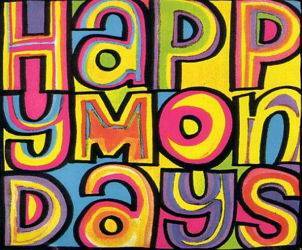 Hence the video of the day for a dreary, rainy Monday is a classic by Happy Mondays, "Step On". It was either that or "I Don't Like Mondays" but that would have been waaaay to obvious a selection. Happy Mondays formed in Salford, greater Manchester in 1980 and were a struggling band until being discovered at a battle of the bands at the legendary Hacienda nightclub. They evolved and worked with various producers and in time became a staple on the rave scene. "Step On" was released in 1990 off their Pills n' Thrills and Bellyaches album and reached number 5 on the UK charts and number 9 on the U.S. modern rock charts. It cheered me up - hope it does the same for you.